The Boys & Girls Clubs of Carlsbad’s Village Clubhouse was transformed into a truly scary haunted house just in time for Halloween, thanks in part to sweat equity provided courtesy of Reef. For the official word from the Boys & Girls Clubs of Carlsbad, please follow the jump.REEF VOLUNTEERS HELP MAKE HALLOWEEN SPOOKTACULAR FOR CARLSBAD KIDS! 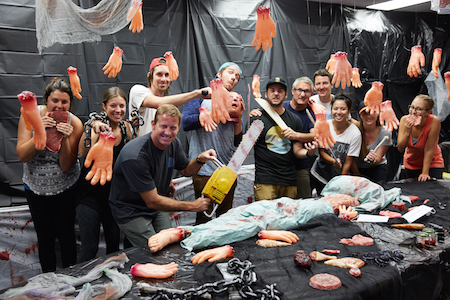 (CARLSBAD, CA – November 4, 2014) The Boys & Girls Clubs of Carlsbad’s Village Clubhouse was transformed into a truly scary haunted house just in time for Halloween, thanks in part to sweat equity provided courtesy of local company Reef. Halloween in the Carlsbad Village is always a special time, and this year was no exception! Thanks to the organizational skills of C3 (Carlsbad Causes for Community), an array of activities were offered for all ages and fright levels. Kids exited the haunted house into the Club gym, which was converted into a fun zone complete with a bounce house, face painting, complimentary pizza, and other fun activities. In addition, kids were able to trick or treat at local businesses. Reef’s thirty year heritage traces back to two brothers from Argentina, Fernando and Santiago “Santi” Aguerre. Fueled by their passion for surfing, and armed with a unique entrepreneurial spirit, the brothers acted on an idea to create a high quality, comfortable, active lifestyle sandal. With $4000 working capital, hard work, dedication and some savvy marketing ideas, the brothers built Reef into the #1 sandal brand. For more information about Reef, visit www.reef.com. Boys & Girls Clubs of Carlsbad has played an integral role in the Carlsbad community since 1952, providing programs and services to thousands of young people. Boys & Girls Clubs of Carlsbad invites you to tour their Clubhouse, and see how lives are changed on a daily basis. The organization is 100% funded by local donors. For more information, call (760) 729-0207, email info@bgccarlsbad.org, or visit www.bgccarlsbad.org.